He's one-half of the droid due every Stormtrooper is looking for, he's protocol droid, C3PO. Until actor Anthony Daniels brought C3PO to life, every other sci-fi robot had come across as a hokey attempt to get a cool robot on screen. 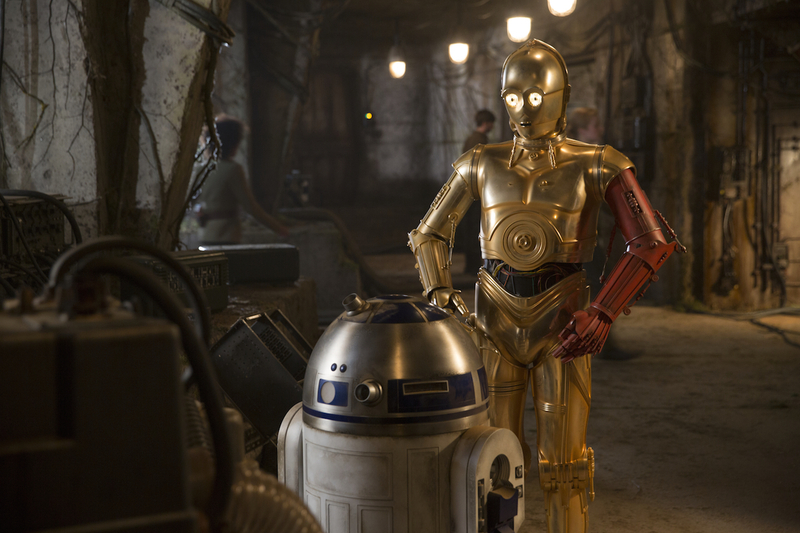 The comedic role in Star Wars fell to C3PO and R2D2. Just think Robby the Robot intoning 'Danger, Will Robinson, Danger' from Lost in Space and you'll know what we're getting at. 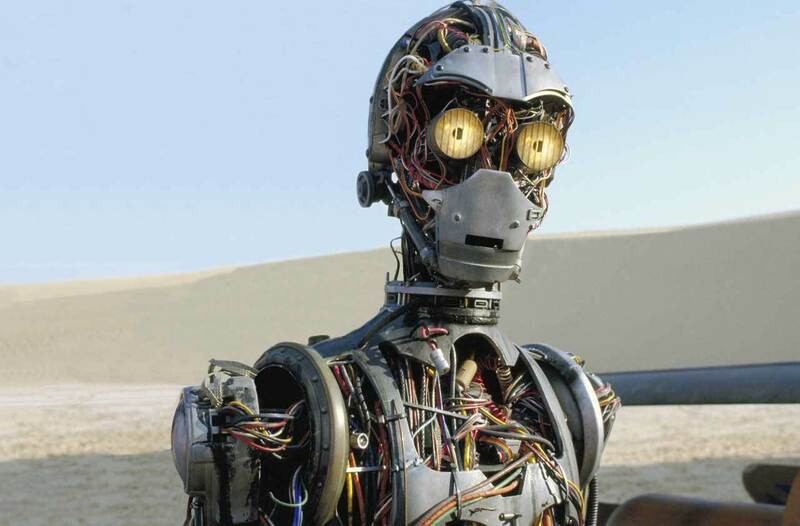 That said Robby totally influenced the C3PO character. Daniel's turn as a robot made robots fun watch. He made 'human cyborg relations' mean something. More often than not the joke was on C3PO as he missed 'the big picture stuff' - does he have aspergers? Some might say he simply had to suffer the torment of being R2D2's best mate. But really, Anthony Daniels and Kenny Baker were one of the movie industry's best comedy duos. Amusingly, we've read that Daniels and Baker didn't really get along in real life! Did you know though that Lucas decided to tell the story of Star Wars through the eyes of these two robots, an idea he took from Japanese film director Akira Kurosawa's Hidden Fortress? Either way, C3PO's lines of dialog from the Star Wars movies served him well and are endlessly quotable. "I suggest a new strategy, Artoo: let the Wookie win." - Aboard the Millenium Falcon, R2D2 is beating an agitated Chewbacca so C3PO suggests the strategy to placate the hairy goof. As an aside - that game was never actually finished. In The Force Awakens, Finn accidentally turns off the Dejarik board and the game begins exactly where R2D2 and Chewbacca left off! "Sir, it's very possible this asteroid is not stable." From Empire Strikes Back. Turns out Golden Rod was right and the Falcon had been parked in the throat of a giant space worm. "Don't you call me a mindless philosopher you overweight glob of grease!" From A New Hope in response to a cheeky comment by R2. "Wait. Oh My ! What have you done. I'm backwards you filthy furball" Chewbacca has put together C3PO wrong after he was torn apart on the Cloud City in Empire. "We're doomed" C3PO cries out as Vader attacks Leia's ship in Episode 4. "R2-D2, where are you?" Once again our robot has lost his best friend. "R2-D2, it is you, it Is You !" Once again our robot has found his best friend. "Excuse me sir, but that R2-D2 is in prime condition, a real bargain" C3PO plays salesman to encourage Luke Skywalker to purchase them both in ANH. "Die Jedi Dogs! Oh, what did I say?" C3PO having an out of body experience in Attack of the Clones. "R2D2! You know better than to trust a strange computer!" How prescient was C3PO in Empire? "Goodness! Han Solo! It is I, C-3PO! You probably do not recognize me because of the red arm..." In The Force Awakens, the Golden Rod demonstrates a severe lack of emotional intelligence as Han and Leia meet each other for the first time in years. C3PO also made a very short cameo appearance in Rogue One. While standing next to R2D2 on Yavin base he complained "Scarif? They're going to Scarif? Why does nobody tell me anything?" Leia Organa: Wipe that nervous expression off your face, Threepio. C-3PO: "Oh, well, I will certainly try General... Nervous?" The key thing to bear in mind is that the success if most of these jokes and quotes are the relationship between Kenny Baker and Anthony Daniels in bringing their characters to life on the silver screen. Many times C3PO is completing the punch line after the set up given by R2D2 thus making them one of the greatest comedy duos to ever grace the silver screen. what do you mean, I'm naked?